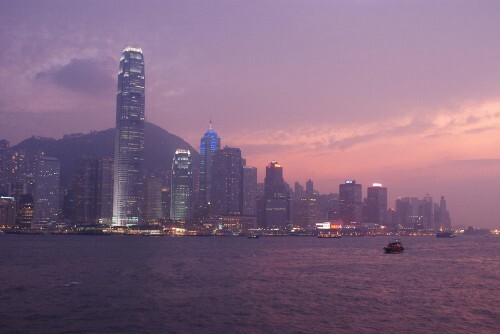 Blog from Hong Kong, Hong Kong | Where is the Love? On the way between Japan and India we stopped off in Hong Kong for three nights.What a place.This was the most crowded city we had been to and after having just been in Tokyo that was saying something.The airport and public transport were all superb however and really new, the manners of the local Cantonese were a little forthright however.Not in Japan now. We made our way round most of the usual tourist things including visiting the Peak for superb views, the star ferry, the big Buddha and even bigger cable car out at Lantau Island, visited the nice Stanley and it's market amoungst other things.We also managed to catch up with my old flat mate Stew and his girlfriend Mhairi who live there which was superb and included a visit to aqua bar for amazing views and fancy cocktails.Unfortunately it also included taking in the Scotland Norway game.Honestly how can you miss that, the entire pub was celebrating a goal then, "what was it offside? ", cue the slow mo replay and "OH NO!". Next and final stop India.